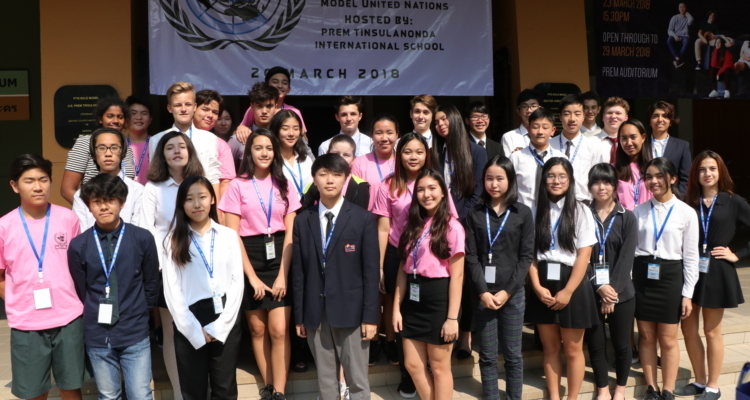 Prem Tinsulanonda International School hosted its second Chiang Mai Model United Nations (CMMUN) conference of the school year on Tuesday 20 March 2018, welcoming over 150 student delegates and teacher advisors from eight schools in the Chiang Mai and Chiang Rai regions. Five committees – the Security Council, Human Rights Committee, and Economic and Financial, Health and Youth, and Environment and Wildlife committees – debated topics ranging from the recruitment of young people by terrorist groups to preventing species extinction due to climate change. Three Prem delegates – Gergö, Paul-Louis, and Namejs – were recognised with the award for Best Delegation in the General Assembly. CMMUN holds a 2-day conference every November and a 1-day conference in March. The March conference is especially helpful to introduce new students to MUN and to give ambitious delegates their first opportunity to co-Chair a committee. Many Prem students new to MUN joined the team for the March conference and it is hoped they will continue their involvement in MUN next fall. Please enjoy watching a short video of the CMMUN and hear what Prem students had to say about this special event.